The beautiful Deadvlei pan was created when the Tsauchab river cascaded through the dry desert area after an abundance of rain. The waters filled a depression with water, forming an oasis in the desert. The waters created the perfect conditions for camelthorn trees to grow, but as the dunes are moved and shifted by the winds the river was cut off from the pan by the red sands. This caused the water to dry up and the trees were exposed to the unrelenting desert sun. All that remains today are their skeletons, burnt black from continued exposure to the heat. 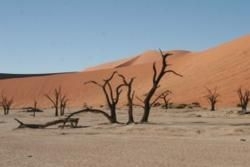 The name Deadvlei translates to "dead marsh" and some of the highest sand dunes in the world form a barrier around the vlei, further adding to its isolation. The vlei is a short walk from the famous Sossusvlei pan and is quite a remarkable sight.